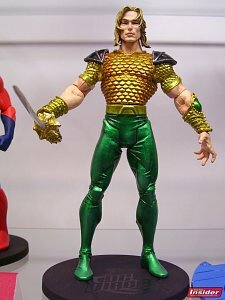 The new Aquaman has an action figure being showcased at San Diego Comicon. The figure is in the First Appearances wave 4, along with the new Blue Beetle, The new Atom, Warlord, and modern Martian Manhunter. This image is from Action Figure Insider, go check out the site for full size images and close-ups. Many thanks to Wally West888 for the heads-up on the new figure.